It’s International Women’s Day and we decided to celebrate it in our own way. We made a tag and everything #mythicwomensday. Be it goddesses of Olympus, monsters that prey on heroes’ flesh or tragic seers that warn others of catastrophes, women have always played an important part in Greek mythology. Yeah, men didn’t really treat them well. Zeus was the prime bad example. But despite all that they managed to inspire us through the centuries. Since we have plenty of stories with female protagonists, let’s take a look at some you might like. The Amazons were the bad girls in plenty of Greek myths. Pretty much everybody fought them, Hercules, gods, demigods. Feared and respected as warriors, they are used in our stories as a powerful private army under the wing of CEO Artemis. Eris is the goddess of Discord. She’s famous for presenting the golden apple to the Olympian goddesses that said “To the fairest” and inciting the most epic catfight in mythology. In our stories she’s a tornado of a woman, always peppy and smiling, bringing breakups to couples Uber-style. The muses were the daughters of Zeus and Mnemosyne. There are plenty of them strolling around the gods in Olympus. You’ve already met Ourania, the Muse of Astronomy and Melpomene, the Muse of Tragedy. In our stories they are androids (gynoids more specifically) that supervise the projects of the Olympian CEOs and are assigned wards to inspire and help with cutting-edge innovation. Read the stories with the Muses. The meaning of the name Cybele/Kyveli is unknown, possibly from Phrygian roots meaning either “stone” or “hair”. This was the name of the Phrygian mother goddess associated with fertility and nature. She was later worshipped by the Greeks and Romans. In our story she’s an alien princess that can blow up when agitated and take the planet with her. The Gorgon sister of Medusa. She was an immortal unlike Medusa. All three have the hair of living, venomous snakes. Known for her bellowing cries and of course her petrifying gaze. In our stories, Evryali is a pianist that puts men and women under an enchantment and makes them love her unconditionally. Erinyes were beings that tormented those that committed the most heinous of crimes. A manifestation of guilt, they chased people forever. 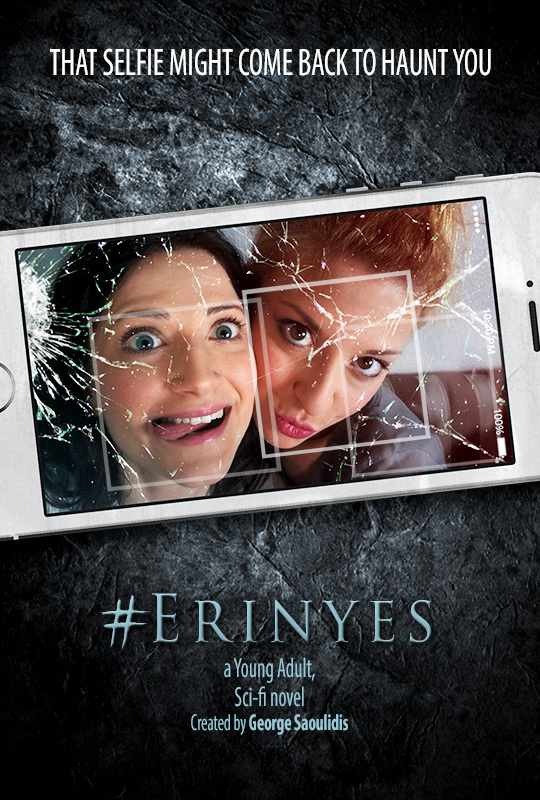 In our stories, Erinyes show up from the guilt of a narcissistic teenager and appear through technology to torment her every 108 minutes. Witches were plentiful in ancient Greece. The Hellenic Witch was one with nature and the goddesses Demeter and Persephone, initiated into secrets like Eleusinian Mysteries and the prophesies of Delfi. In our stories, the witches try to live normal lives in the Athens of today, using the wonders of technology along with the arcane practices of the goddesses. Comment about which Mythic Woman archetype you like best, or what inspires you. Follow me on Amazon and Get Nagged by Them Too! I need you to do some clicking, it will only take a second. Follow once, get tormented for eternity. Now, where have I heard that one before? Is it done? Come on, it’s two clicks. It’s a nifty way to get all the new releases we’ve got lined up, you’re already missing out, you know. #Erinyes is now following you. Forever. Erinyes (known as Furies in Roman Latin) are three goddess avengers of the crimes of murder, unfilial conduct, impiety and perjury. They recently discovered selfies as well. Yes, mythical creatures now have their own Twitter profiles. Feel free to follow her, if you dare. In the story Erinyes, Mahi is a self-adoring teenager who, just like most teenagers these days, only cares about the amount of likes and retweets that she gets on her (admittedly hot) selfie pics. Mahi notices something strange in her latest selfies. The entity she notices on her selfies is becoming more and more solid, until it actually starts chasing her non-stop. That entity is Erinyes, and she chases her victims precisely every 109 minutes for one frantic minute of intense manhunt. Along with her friend, Deppy, a remarkably tech-savvy girl in her cutesy personality, and the enigmatic Prodromos, a conspiracy-theorist rebel hacker, Mahi has to find out the truth behind an insane corporate conspiracy while Erinyes is following her. Possibly forever. The story comes out in a young adult novella and a short movie tie-in, which you can get a glimpse of in the teaser here. Download the Erinyes Novella on Amazon! Do you want to get notified as soon as there’s something new and cool going on? Enter the email list to stay informed! That selfie might come back to haunt you. Just click below, sign up with your email and download (PDF file). Click Here to Get on the Mythographer’s List And Get The First Chapter For Free!